How can I use Didger to convert Lat/Long into feet or meters for volume calculations in Surfer? Often when calculating volumes in Surfer the elevation data is in Imperial or Metric, but the xy coordinates are in Lat/Long. This is usually the case when using field data collected with a GPS unit. These mixed units will produce meaningless results when using Surfer's Grid | Volume command. Where you may expect a net volume of hundreds of thousands of cubed units, the results are usually a few thousandths of a single unit. To match the units on all three axes you will need to convert the Latitude and Longitude coordinates to a system whose native unit is feet or meters. You can do this in Didger 5 with either Surfer Grid [.GRD] files or the original xyz data file. First identify the z data unit. If the Z units are meters, then the Lat/Long coordinates will need to be converted to UTM meters. If feet, you can convert to State Plane, or UTM feet. Use Didger's File | Import command to import the grid or spreadsheet. If using a Surfer Grid file the coordinate and elevation data will automatically associate with the correct fields. If using a data file choose your x and y coordinate columns and assign the column containing elevation data to the Primary ID. Click OK. In the Assign Coordinate System dialog choose Projected Coordinates, Geographic (lat/lon), and the Datum. Knowing the correct Datum will increase accuracy. 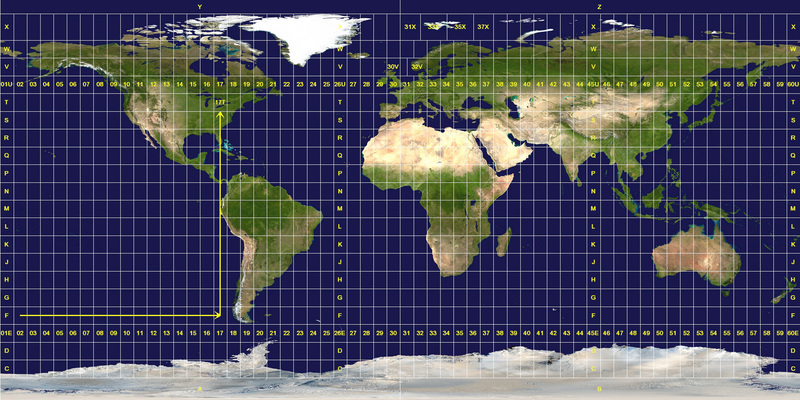 The most common datum for lat/long coordinates is World Geodetic System 1984. After importing the data and assigning it the initial projection you will need to convert it. Use the menu command Map | Change Projection to access the Assign Coordinate System dialog. Change to either UTM or State Plane 1983 under Projected Systems. Here you will need to either know the UTM zone or the State Plane zone. For example, UTM zones can be identified here, or you can use a website like this. Click OK.
After converting the units you will need to export the data. If your initial data came in a grid file you can use Didger's Map | Surfer | Grid Data command to generate a new grid file using the Nearest Neighbor method. If your data set was in a spreadsheet you can use the File | Export command to export the points as a DAT file. You can then use Grid | Data from within Surfer and regrid the data using the Nearest Neighbor gridding method and the same grid resolution as the original file. After performing this operation on the upper and lower surface data sets you can then use Surfer to perform your volumetric calculations. If your data was in spreadsheet form you will first have to grid the file(s) in Surfer using your preferred gridding method. If they were Surfer grids you can perform these calculations right away. See also: How do I convert/change the projection of a Surfer GRD file in Didger 4?